I thought I would start my open inquiry by looking back through my notes from the Indigenous Studies course I took at Camosun in the fall of 2017 as my Canadian studies pre-requisite to the Teacher Education Program at Uvic. 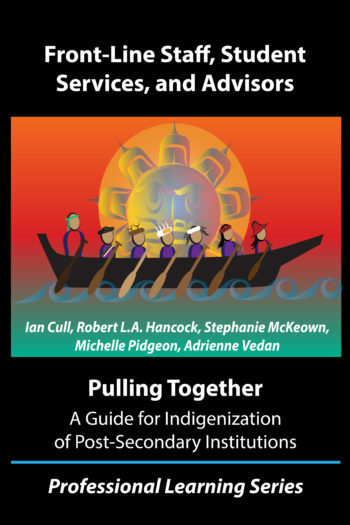 I also found a great e-book called Pulling Together: A Guide for Front Line Staff, Student Services and Advisors that has a section on Indigenous Ways of Knowing and Being. 1,673,785 million Indigenous people speaking 70 different languages in what is now known as Canada. While all Nations are culturally unique, they share a common wholistic worldview that sees a whole person (mind, body, spirit) as interconnected to both the land and the other beings that share the land. A worldview is how you construct and make sense of the world around you. As a teacher it is important to understand that each student comes to the school with their own unique worldview. 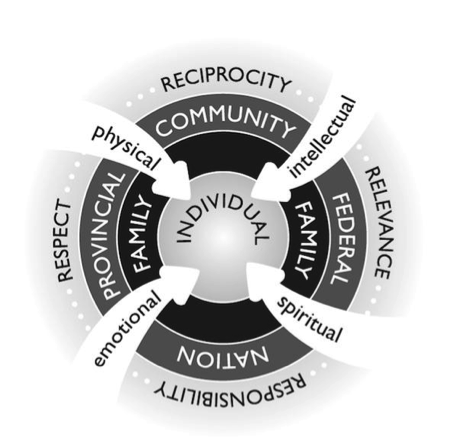 When supporting Indigenous students in the classroom Kirkness and Barnhardt (1991) suggest using the 4Rs to support Indigenous students: respecting Indigenous knowledge, responsible relationships, reciprocity, and relevance. This framework is aimed at post-secondary institutions but I think that it is a useful visual when thinking about how to support not only Indigenous learners but all learners. • Holistic―It engages and develops all aspects of the individual (emotional, physical, spiritual and intellectual) and the community, and stresses the interconnectedness of all life under the Creator. • Lifelong―It begins before birth and continues through old age and involves the intergenerational transfer of knowledge. • Experiential―It is connected to lived experience and reinforced by traditional ceremonies, meditation, storytelling, observation and imitation. • Rooted in Aboriginal languages and cultures—It is bound to language, which conveys a community’s unique values and worldview while ensuring cultural continuity. • Spiritually oriented—It possesses a spiritual element which is fundamental to the learner’s path to knowledge. This is manifested in spiritual experiences such as ceremonies, vision quests and dreams. • Communal activity―It is a communal process in which parents, family, Elders and community have a role and responsibility. • Integrates Aboriginal and Western knowledge―It is an adaptive process that draws from the best of traditional and contemporary knowledge.